Having a great time laughing! All joining in the fun! 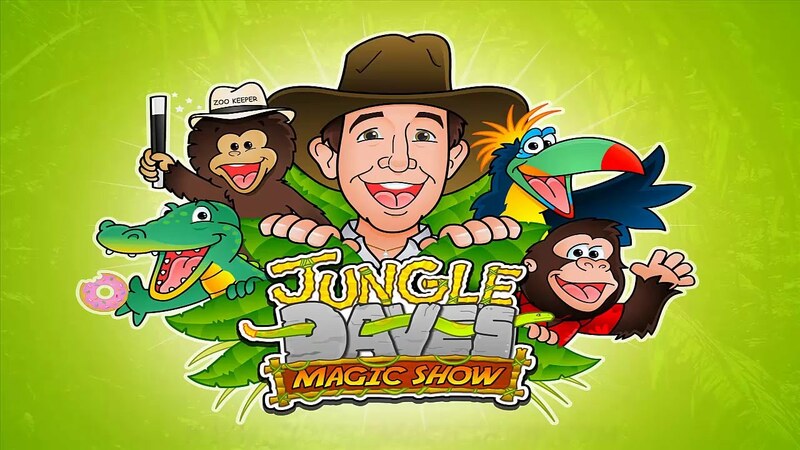 Jungle Dave’s Jungle Magic Show provides all-inclusive and action-packed entertainment packages, giving you time to sit back and relax. I will make your child’s birthday unforgettable. My highly entertaining, action-packed show takes you on a wild adventure through the jungle – right in your living room! I will create a memorable, energetic and hilarious show that your guests will never forget. The wonder, astonishment, and delight on the children’s faces are what you will remember most! Girls and boys will also get to meet some of my wacky jungle puppet friends, and will roar with laughter during my routine. And now, ask about my Halloween Spooktacular Magic Show! Perfect for all ages! Such a great show kids had a blast laughing ,jumping ,trying to figure out how the magic is done . So easy on me I got to watch and laugh with the kids and be part off it . All the kids enjoyed it a lot and adults had great laughs and moments . I wish I could aay something better than amazing but it truelly was. Highly recomend for the young 3-4 but also 7and up . Best entertainment we've ever had! Thank you very much, Mary! I definitely had as much fun as all the kids! And Emma was the perfect helper! We hired Jungle Dave for our sons 5th birthday party. He was fun, energetic and kept the kids entertained the entire time. We booked the 2 hour show and it was worth every penny!!! He’s very reasonably priced considering everything he does during the show. He did magic, danced and played games with the kids. His interaction with the kids and adults was amazing. I couldn’t have asked for a better time. I would definitely use him again and recommend him to anyone looking for a great time at a birthday party. We had Dave in for our Cub Scout Blue and Gold dinner. The kids had a blast, and they were engaged the entire time. My two sons talked about the show all weekend too. Additionally, Dave is easy to work with and will work around you to make the show great. Highly recommended. Thank you Brian, your Cub Scout Den was a lot of fun to perform for! I'm glad they had a great time! Thank you again! Jungle Dave was a hit at our daughters birthday. He kept the kids engaged and entertained the entire time. From the day we booked, to the day of the party, he made sure our party would be a success. I highly recommend him to anyone looking for great entertainment. 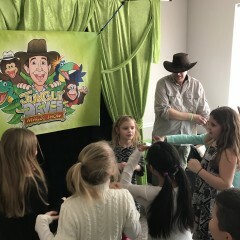 Jungle Dave knocked it out of the park at my daughter's birthday party! 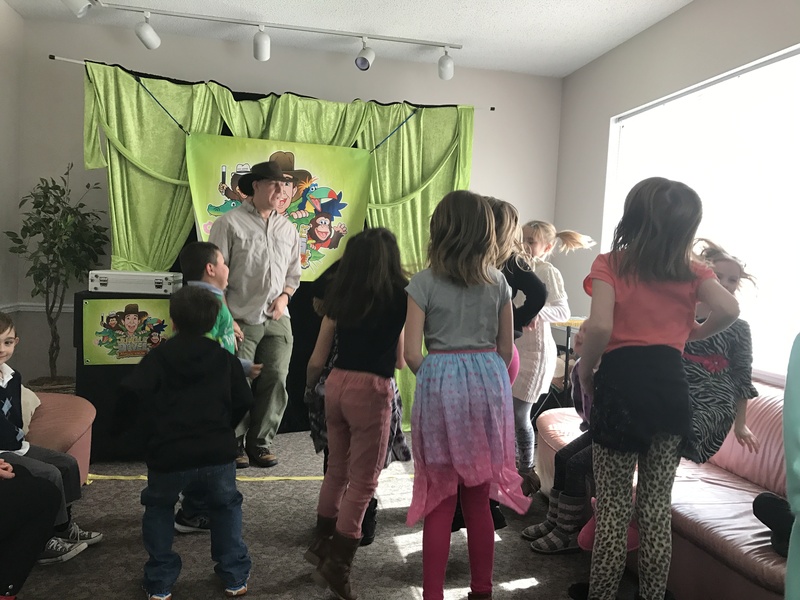 He was able to keep 26 kids engaged and totally having fun the entire show. Even all the parents sat through the show genuinely entertained and laughing. 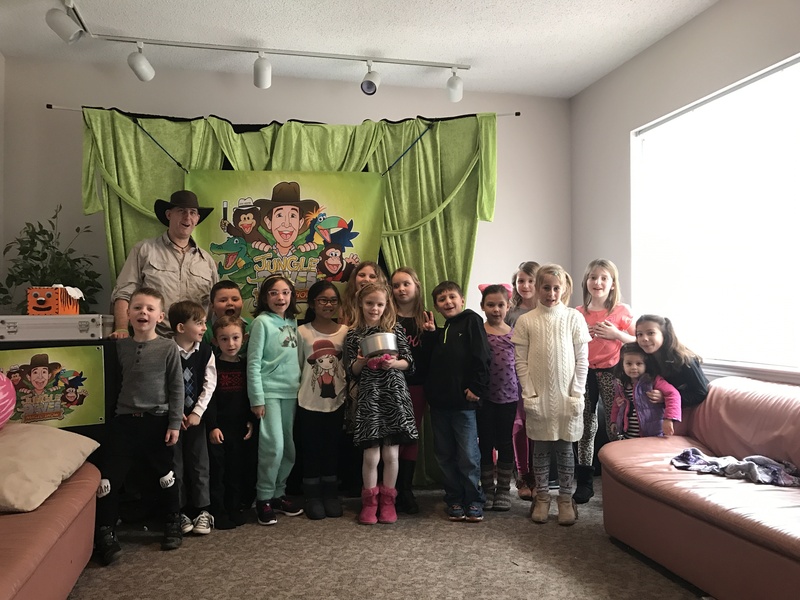 Very creative, fun, engaging and hilarious performance...everyone had a great time and all the parents were inquiring how to book him for their parties. 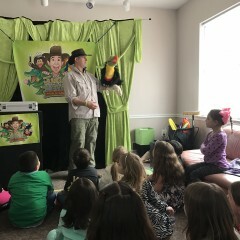 Jungle Dave did a great holiday magic show that kept 30 kids engaged and entertained for about 90 mins! We were all impressed with how the kids sat still for so long! Would highly recommend him for any children's event! We just had an amazing 8 yr old birthday party for our son Reagan two days ago. Everyone had so much fun! 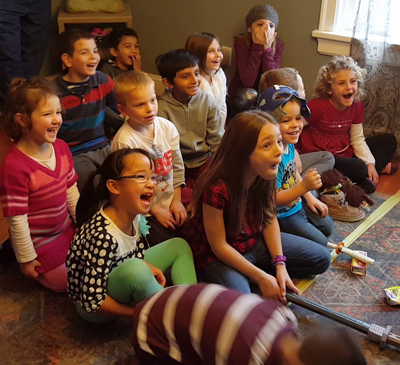 All the kids in the room had a blast! All of our friends kept saying that they had so much fun. Until this day we were still talking about it. Mr.Dave we will not forget you! You are the best! 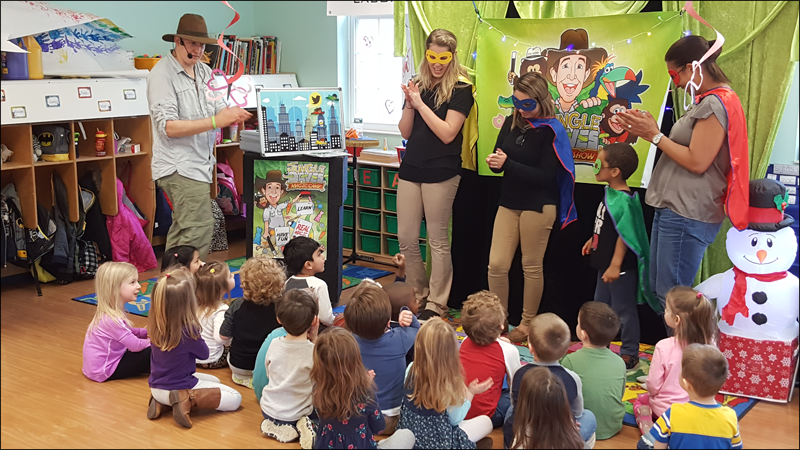 Professional, and entertaining to children and adults! 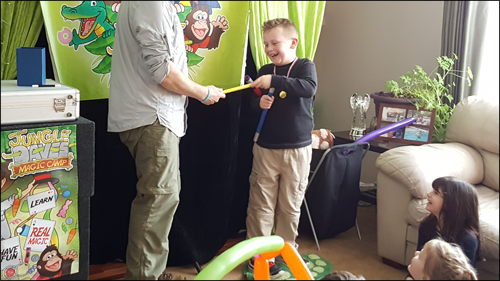 Have used Jungle Dave for two birthdays already, because my 5 year old loves his entertainment so much. Dave is very professional and knows how to manage kids. He was really amazing and our 6 years old son had his best party ever.. Thanks Dave! Jungle Dave provided entertainment for our son's 9th birthday party at our home. Everyone loved it - both the kids and the parents!! He's funny, does great magic tricks, and gets everyone involved. We can't say enough good things about the show - we will remember it forever. 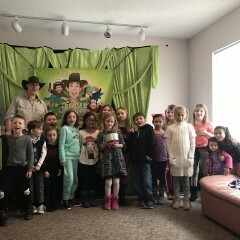 The kids had a great time with Jungle Dave. He kept the kids entertained for almost 1.5 hours. We are definitely getting him back for more parties. Jungle Dave did a phenomenal job at our joint birthday. The kids had so much fun and first time throwing a party where I actually got to relax. He really was the highlight of the party! Would recommend to anyone! I would really recommend this magic show, the kids had a full on 75 mins entertainment in my son's birthday party. The magician was very patient and friendly with kids and the kids had a blast !! Dave did a great job at my son's 3rd birthday party. I'm not sure how he kept all kids engaged for more than an hour but he did. He had exercises to tire them out first and when they sat down you could hear the laughter and fun in the room. He even brought gift bags with some of the items he used in his magic show. He was prompt: showed up earlier than promised, set up the theatre and was very courteous and nice. I kept getting compliments after the show and some of my friends will be hiring Dave to come back again for another show. All in all i was very happy with the party and his rates were very reasonable. Great Show! Kids Loved it! Dave did a great job at our party and went above and beyond to make sure all the kids were happy and having a blast! We hired Jungle Dave for our children's summer entertainment program. The kids were entertained and Dave has a good time joking with the kids and bring a few up on stage to help. This is a good show for ages 7-8 and under. The kids had fun! We would hire Dave again. 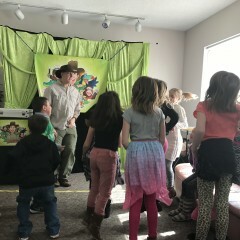 Dave did a great job entertaining the kids aged 2-13! Everyone was laughing and engaged! He was professional and on time! 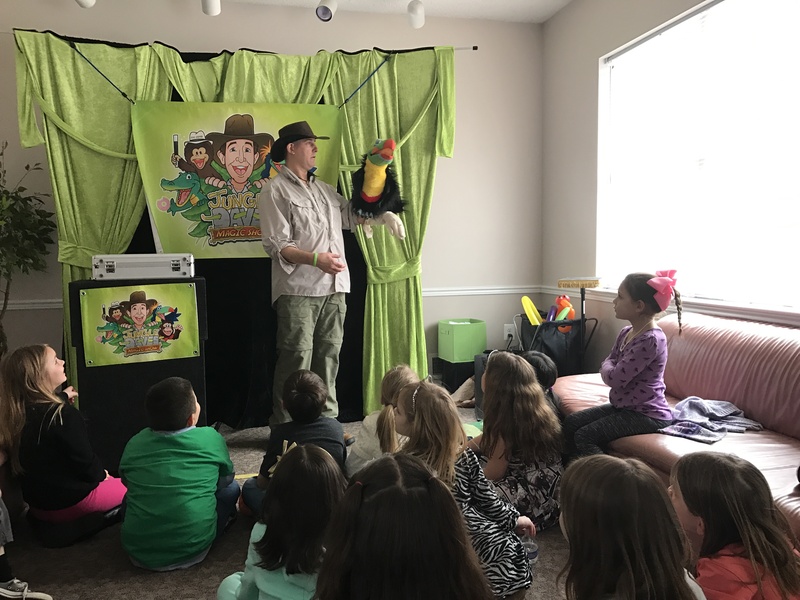 Jungle Dave made my son's 7th birthday party so much fun! (and so easy for mom!) He was great - kept a group of about 20 kids entertained for over an hour. He was very professional, easy to communicate with and really a pleasure to do business with. Jungle Dave's show was a blast! 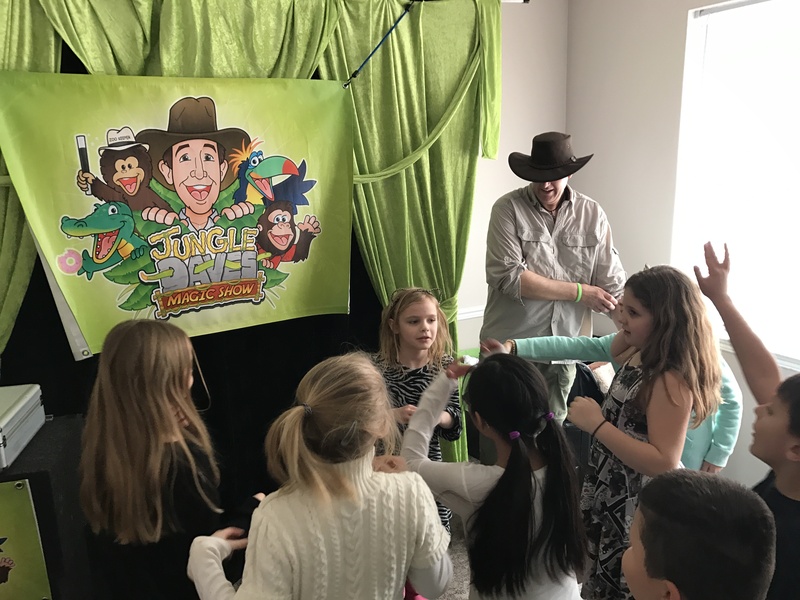 We booked Jungle Dave for our son's 7th Birthday party and all the kids had a great time! Everyone was laughing and amazed by the magic! Jungle Dave even stayed after his allotted time to make balloon swords and fishing poles for the kids to play with. Thanks again for making our sons birthday unforgettable! 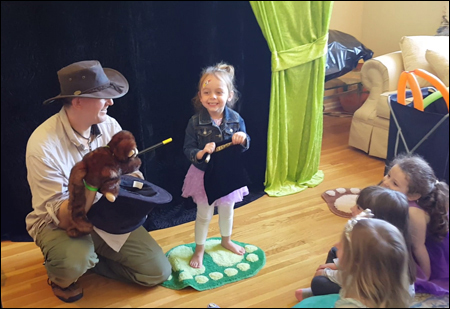 My Jungle Magic Show will make your child’s birthday unforgettable. My packages range from 40 minutes of non-stop magic and fun, to a two-hour magic, music and games extravaganza – entertaining your guests from the moment they arrive with hilarity and excitement. The all-inclusive 2-Hour Magic, Music & Mayhem party package is the ultimate in children’s entertainment. You are free to relax, and enjoy the day, as I will handle everything. Avoid the stress and hassle of trying to plan and coordinate multiple activities for your guests. My love of magic captivates audiences of all ages. My magic skills and showmanship a delightful atmosphere full of fun and laughter. I combine magic, ventriloquism, illusion, and fun to the delight, amazement and entertainment of audiences of all ages. The most important thing to me, though, is the connection I make with each and every member of the audience. The wonder, astonishment, and delight on the children’s faces are what you will remember most! My show is completely self-contained. I will bring everything I need in order to make a memorable experience for you and your guests.